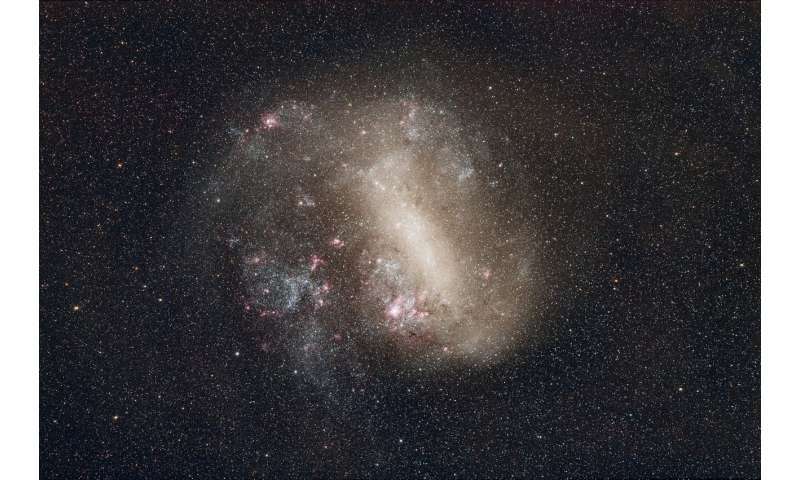 "But in the Large Magellanic Cloud, we have very old clusters as well as ones that are very young—but nothing in between." The counter rotation of stars is a prediction of the assumption that Birkeland currents are powering galaxies. For which there is zero evidence, nor even a valid mechanism. It is pure woo. There is a hypothesis, a model, a maths derivation, and an observational confirmation. This is exactly how science works. And no faerie dust is required such as the standard model. Really, and where is that? There is zero observation of the required currents, zero mechanism for their e.m.f, and I have seen no maths to describe how stars are being moved by these non-existent currents. jonesdumb has denied this observational support before by essentially saying, nuh uh! 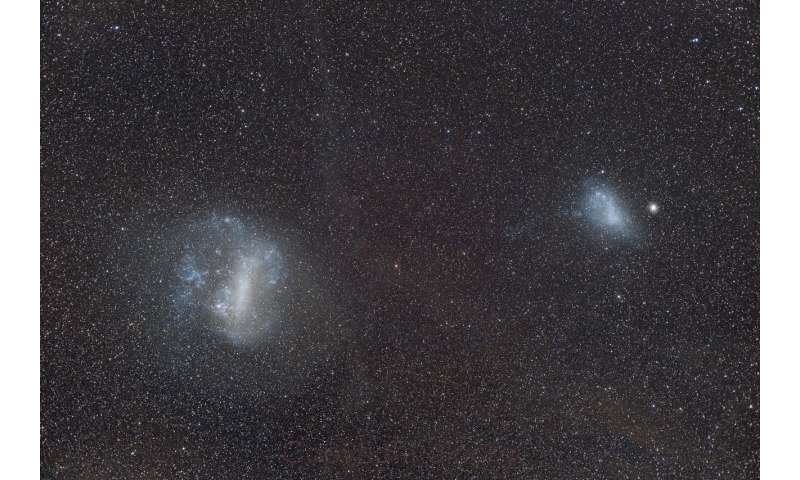 The Magellanic stream connects these galaxies to the MW, it's observational confirmation of the required currents. jonesdumb will predictably respond by saying nub uh, but that is merely his wilful ignorance speaking. The creation of the emf by Birkeland currents has been repeatedly confirmed in the lab, and confirmed by measurements of Earth's Birkeland currents. Hand wavy denials are the tools of the willfully ignorant. jonesdumb is the poster boy. And what has that got to do with anything? It ani't a current, and nobody is claiming that it is. Unless they're stupid. Nobody is saying that the Magellanic stream is a current. Other than unqualified idiots. I don't care what happens in a lab. 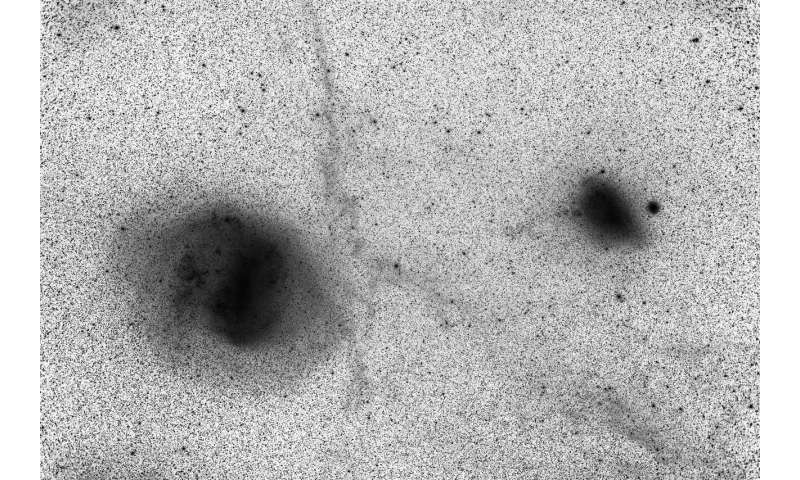 What is creating these invisible, non-existent currents between galaxies? So, that was your observational and mathematical proof, was it? No currents, no maths. Try to do better. Stick to Velikovsky. I don't care what happens in a lab. I know you don't, the entire edifice of your religion is based upon maths fantasy. What was said about the greatest pseudoscientist of all-time? What did one of the greatest scientists of all-time once say? That is a fundamental difference between you and I. You are fine with denying direct experimental laboratory and in situ evidence in favor of your hypothetical beliefs because you have been convinced by the plasma ignoramuses that astrophysical plasma behaves differently "over there". I, on the other hand, agree with Alfvén. As has been shown since the first rockets sent into space, space is nothing like the pre-space-age beliefs of an inert vacuum. ^^^^^^Yada, yada, yada. No amount of experimenting is going to make an e.m.f. suddenly appear in the cosmos, No amount of experimenting is going to make these non-existent, undetectable currents suddenly leap into view. No amount of experiment is going to overturn the fact that the Sun is powered by nuclear fusion. And I think you'll also find that although Alfven preferred experiment to theory, his view was that observation trumped both. And you have none. Well, unfortunately for him, he died just as the MRx experiments were starting up at Princeton, so he missed out on seeing himself proved wrong. As he would later be by in-situ observations. Which were his gold standard. "An electromotive force ϕ = ∫ v × B⋅ dl giving rise to electrical currents in conducting media is produced wherever a relative perpendicular motion of plasma and magnetic field lines exist (Sect. 3.5.2)." This statement is experimentally confirmed, observationally confirmed, maths confirmed, and applied daily by the modern society in which we reside. As mentioned above, it is you who are denying direct evidence in favor of your hypothetical beliefs. As shown in the phy.org article I linked above, the large scale magnetic fields are highly ordered yet there are areas of highly turbulent plasma. These areas create the emf, Birkeland currents then carry the energy across the Cosmo, as the theory suggests. Plasma behaves like plasma. Well, unfortunately for him, he died just as the MRx experiments were starting up at Princeton, so he missed out on seeing himself proved wrong. As he would later be by in-situ observations. Evidence please, or is this another of your hand wavy claims. What was "proved wrong"? Uhh, cant dear fellow. You really need to reconsider and rewrite your last comment. You seem to be accepting jd's arguments as somehow being negative proof that your arguments are accurately wrong? Wrong. If there were Birkeland currents connecting galaxies they would stick out like a sore thumb in COBE, WMAP and Planck maps. They are nowhere to be seen, nor is there any mechanism by which they can explain stellar orbits around the galactic centre. It is pure woo. Nobody takes this nonsense seriously. I don't need to hand wave anything, woo boy. Your nonsense is impossible and unevidenced. The whole of the relevant scientific community dismisses it. Those that have even heard of it, given that Peratt's piss poor model hasn't been touched in decades. If there were Birkeland currents connecting galaxies they would stick out like a sore thumb in COBE, WMAP and Planck maps. It's already been explained to you multiple times, Verschuur has explained there is a local "fog" created by nearby electric currents. What you are thinking you are looking at in those maps is not what it really is. And as some ideas are not completely accurate you apply new knowledge, just as you claim is okay for the dirty snowball guess, to explain discrepancies. Peratt's galaxy evolution models replicate numerous specific aspects of galactic evolution. You don't cast it aside due to one failed prediction when there is an explanation provided by an expert in the relevant field. Despite your hand wavy claims, the plasma ignoramuses at the pppl don't have it figured out by a long shot. Nor have they falsified anything Alfvén ever produced, ironically in spite that Alfvén did it of himself. LOL! Could you link the maths derivation please. Wrong. And they are not hand wavy claims, liar. They are observed facts. Seen in the lab, and seen in-situ. Idiot. Alfven was wrong. End of story. Even Falthammar dumped Alfven's misconception. So, every single plasma physicist that doesn'y believe in your woo, is an ignoramus? So, that would be all of them, yes? Please give us a list of living plasma physicists who aren't on your list. Preferably those involved with the idiotic EU non-science. They are observed facts. Seen in the lab, and seen in-situ. You are so dumb you can't even grasp the difference between interpretation and fact, pathetic. Even Falthammar dumped Alfven's misconception. Just exactly what Alfvén warned against, which you still believe to be true. So, every single plasma physicist that doesn'y believe in your woo, is an ignoramus? "Magnetic reconnection takes place when magnetic lines of force—or field lines—break apart and reconnect with a violent burst of energy"
Complete and utter crap from somebody who hasn't a clue about plasma physics, and that goes for the rest of his idiotic cult. No interpretation, dummy. Observation. And nobody is disputing it. Lol. What an idiot! Did you read that paper, you stupid fraud? What are you trying to hide by only linking to the abstract? This? Want some more from Falthammar on reconnection? Wrong idiot. Show me who has published such crap. Since then, an overwhelming amount of empirical data have proven that magnetic field aligned electric fields exist and are of key importance in the physics of auroras [Falthammar,2004], in ***magnetic field reconnection [Mozer,2005]***, in shocks [Mozer et al,2006],and in plasma turbulance and many wave modes. That is why the lying, obfuscating crank didn't want to link the freely available paper! You are a moron squared! Using the title MRx doesn't change a thing, Falthammar himself wrote an article about the misuse of the moving field line concept. If the plasma ignoramuses use those concepts they are practicing pseudoscience. Hence quoted statement from pppl states pseudoscience per Falthammar's paper. If these people can't figure out how to find the paper they would not be able to grasp these ideas anyway. Laboratory (PPPL) sends 10,000 volts of electricity into a chamber filled with hydrogen gas. The charge heats the gas to 100,000 degrees Centigrade. In an instant — onethousandth of a second, to be precise — a process called "magnetic reconnection" takes place." That is the definition of electric discharge. No it isn't and no scientist is saying that it is. Only ignorant loons like you. And you are an irrelevance. No it isn't and no scientist is saying that it is. "With the click of a computer mouse, a scientist at the U.S. Department of Energy's Princeton Plasma Physics Laboratory (PPPL) sends 10,000 volts of electricity into a chamber filled with hydrogen gas. The charge heats the gas to 100,000 degrees Centigrade. In an instant — onethousandth of a second, to be precise..."
It couldn't be any more clear. That is an electric discharge! No, it isn't. That is just you being thick. Show me in the scientific literature anybody suggesting that reconnection is an electric discharge, and I will show you a complete idiot. You are as thick as the rest of the EU cretins when it comes to plasma physics, given that none of you loons have ever studied it, have you? Go play on you mythology forum, woo boy. Science is not for dummies who believe Earth used to orbit Saturn, among other cretinous beliefs. "a scientist sends 10,000 volts of electricity into a chamber filled with hydrogen gas. The charge heats the gas to 100,000 degrees Centigrade. In an instant — onethousandth of a second, to be precise..."
Explain how that statement between the quotes is not an electric discharge, in simple terms. Feel free to use your usual grunts and murmurs if it helps. How the hell do you think they turn H gas into H plasma, which can then reconnect? Seriously, do you need this explained? Idiot. Electric discharge, which goes to show they are running electric discharge experiments and trying to explain processes which have already been described by real scientists but in their own pseudoscientific claptrap. Christ you are thick. Just goes to show that you haven't a clue about laboratory plasmas either. The plasma is created in an existing magnetic field. The field is altered somehow, and reconnection happens. Just as seen in-situ. Not a single sane scientist thinks that the pppl experiments are electric discharges. Only a clueless blowhard like you. Stick to mythology. The field is altered somehow, and reconnection happens. The "somehow" is due to the electric discharge, it's how plasma transfers matter and energy. Nope, he explained it briefly in the video. They alter it themselves. I'm sure you could email them for an explanation. Given that nobody is questioning that MR happens, then I rather think that you are wasting pixels. Which doesn't change the fact this is an electric discharge phenomenon. Altering electric discharge experiments with magnetic fields has been going on for well over 100-years, stop pretending the plasma ignoramuses at pppl are doing something unique. They are only attempting to reinvent the wheel using pseudoscientific claptrap. Wrong, and nobody agrees with you. Given that you are an unqualified nobody, and a Velikovskian cultist, your idiotic pronouncements are of no relevance, nor interest. So you are unable to explain in simple terms how the phenomenon is not an electric discharge. So you jump to name calling and strawman arguments. You should send GED you claimed to have back to whatever educational institution made the mistake of giving it to you. I don't need to explain anything. Nobody is questioning that they are observing MR. Please show me a scientist who thinks otherwise.